Overall, I think the LifeStraw Family is an excellent water filter for the price! It will handle the needs of an average sized family for all washing, cooking and drinking water and will continue to do so for about 3 years - that is pretty impressive for around $60.00. I highly recommend getting the LifeStraw Family 1.0 - there are no other water filters out there that can do what it does for such a low price! I think everyone should have one of these stored away for emergencies - at home in the city or the country, work place, or traveling. Simplicity is What Makes The Lifestraw Family Great! Well, it has been awhile since I have done a review, but to be quite honest, there are not a lot of good portable water filters out there to review, and since I am not rolling in the dough, I try to buy those I think are good… and so far I have been right. 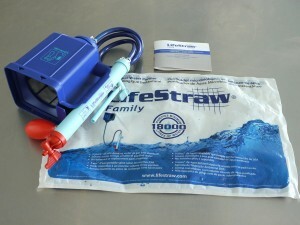 My latest purchase, the LifeStraw Family 1.0 is no exception. I was finally able to get my hands on a LifeStraw Family 1.0 unit. I was on the waiting list for over a year! Then, when I finally got it, I became so busy with work that it was another month before I finally got around to testing it – and now I finally have to time to write the review. I do have to say, I like Vestergaard products (the makers of LifeStraw), their water filters are very reasonably priced and well made for the money! 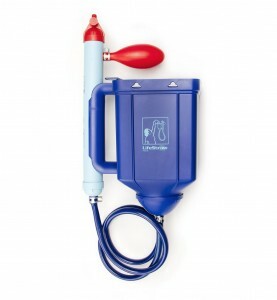 I’ve just ordered a second LifeStraw Family as a backup (or if friends/family need it in an emergency). Note that the LifeStraw Family filters down to 0.02 microns! That is incredible filtration and even better than the LifeStraw Personal Filter and most other water filter on the market that do not use a power source of any kind. In addition to the list above, the water I tested (from a dirty puddle in the back yard) tasted great! After my own test and what others say, there is no funky plastic taste with this unit. The only differences are likely to come from the water source itself – much in the same way that water from one city can taste very different than another. The LifeStraw Family 1.0 will not remove salt or chemicals. In most cases, and most places where you need this type of water filter, this shouldn’t be a problem. If you happen to live in areas with heavy industry and waters polluted by these sources, you may need additional filtering systems to clean the water and remove those types of contaminants. In other words, if you are buying a water filter for emergency use in polluted industrial areas, you will need much more than this water filter, and most others similar to it. These filters are designed to protect against natural threats, not man made chemicals and poisons. Ironic… that man can create harmful particles that are hard for us to filter out of water? As with any water filter, it cannot withstand freezing – this includes storage. If you live in a cold climate and store this unit in an unheated shed or garage it may get damaged (and become a risk) if any traces of water are left inside and they freeze. I did two tests a few months ago before the snow started to fly, one with muddy water from a puddle in the yard, and a second using water from a nearby pond. In both cases the water came out very clear and tasted fine. Although both tasted different from each other, neither tasted off. If you buy one of these, remember that other elements in the water will give each source of water a slightly different taste. The bottom line is that the LifeStraw Family has been used constantly on some of the worst sources of water around the world with continued success. You won’t have to worry about the water if you process it correctly using the instructions provided with the unit. 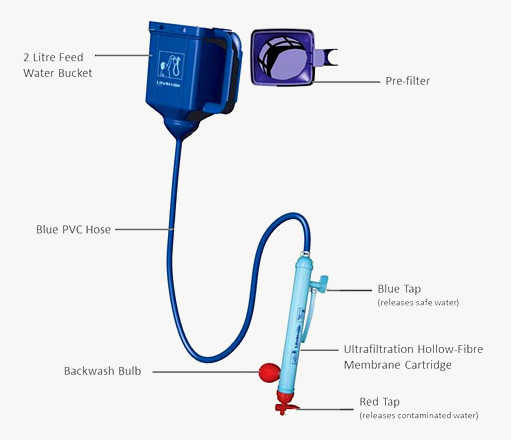 In almost every video I have observed people setting up the LifeStraw Family unit with the 2 litre water bucket almost directly above the output tube (and hose) leading into the container for clean water. This does not strike me as very safe or sensible, especially in places where the water could contain serious contaminants. Pouring dirty water above the container used to collect clean water is asking for trouble, all it takes is a few drops to enter this container and you could easily get very sick! I would recommend offsetting the main 2 litre bucket from the clean water container by a foot or so (30 cm to 40 cm). In this way, if water is spilled while pouring into the top bucket, it will not get into the clean container. If that is not possible, cover the clean container so contaminated water cannot get into it, or on the surface (personally, if the water is that questionable, I would do this all the time). 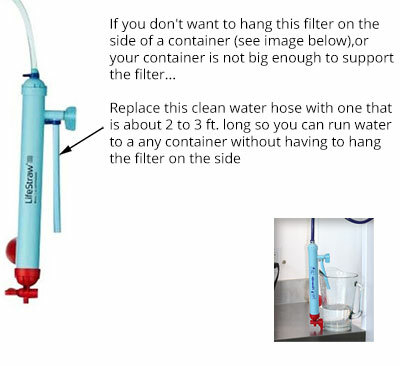 You can also change extend or change the clean water hose with a longer hose so you can keep the clean water container away from the filter and intake bucket (contaminated water). See Image on right. Instead of me trying to tell you how the LifeStraw Family works and how to use it, please watch the video below. 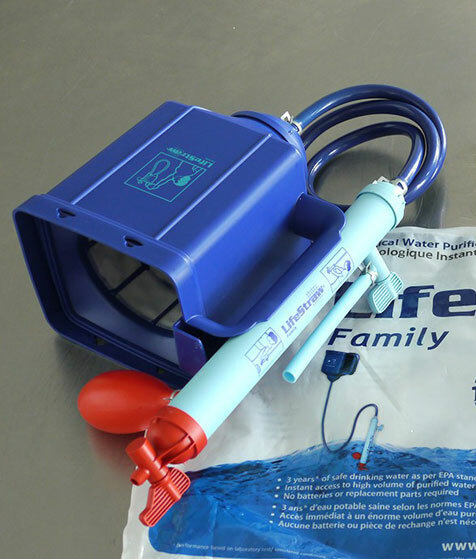 The LifeStraw Family 1.0 comes with very clear and easy to follow instructions – be sure to follow the instructions and read them completely before you start. Also, keep in mind the unit is a little slower in first use and will have increased flow after a couple of uses. On average, 2 hours to fill a 5 gallon bucket is pretty close, but the actual flow you get will depend on how dirty the source water is as well. The best thing about the LifeStraw Family is “Gravity”, no pumping, no power, just let gravity do the work. You can add 2 litres of dirty water, go do something else, come back and top it up and carry on – very easy! LifeStraw Family 1.0 Construction & Quality? 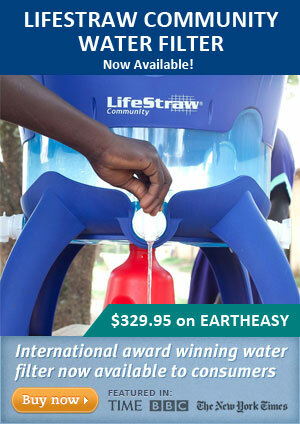 For $89.95 the LifeStraw Family is Excellent Value! For the most part, it is made of impact resistant plastic and all the parts fit together very well. There is nothing that stood out from my inspection, and use, that I would be concerned about. 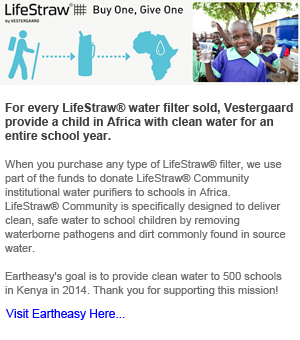 If you own a LifeStraw Personal Filter, you will know what I mean. The lifeStraw Family is made to last 3 to 5 years. I would say that this is very accurate. The unit should easily last this long used in an environment like Africa, and much longer if you are planning to keep it only for emergency in your home. Of course, it goes without saying, you have to take care of it and make sure you are not careless with use and cleaning. Overall the unit is very light weight and well thought out – and strong! The hose is about 39″ long (1 meter) and 60″ overall (1.6 meters). How Portable is The LifeStraw Family? Well, if you plan to take it backpacking you will likely be a little frustrated, it is to big for this purpose. On the other hand, any use where you can easily store it such as a RV, Home or Cabin is ideal – and for any situation where you can transport it in a vehicle. Nothing shows off a product better than videos showing it in action. The 3 videos below cover most of the situations and conditions you are ever likely to encounter. One is from ABC News and the last one is from Vestergaard with the CEO of the company in Africa. It will handle the needs of an average sized family for all washing, cooking and drinking water and will continue to do so for about 3 years – that is pretty impressive for $89.95. It is very well made and I really think it would be hard to break unless you are really rough with it. If I was planning to travel into, or over rough terrain, and expected to be in some nasty situations, I do think I would bring an extra hose, clips and backwash bulb – these are about the only parts I could see getting damaged (maybe the pre-filter too). However, it all depends on where you are planning to use it and how often. The quality of the filtered water is great, no odd tastes during my testing and no plastic taste. I am pretty sure this unit could filter some pretty disgusting water and come out clear and tasting fine. For the price, which I feel is low, I highly recommend getting the LifeStraw Family 1.0 – there are no other water filters out there that can do what it does for such a low price! I think everyone should have one of these stored away for emergencies – at home in the city or the country, work place, or traveling. Personally, I prefer to buy from Eartheasy. Their prices are reasonable, delivery is fast, and they are company with an environmental and humanitarian focus. However, oddly enough Amazon.com usually has better stock.